Heat 1 tablespoon oil over medium-low heat in a medium skillet. Add onions, season with salt, and cook slowly for 30-40 minutes, stirring occasionally, until onions are caramelized, golden, and soft. Raise heat to medium, add 1/4 cup of water to pan, and stir to scrap up any browned bits. Simmer until all water has evaporated. Remove onions to a small bowl and set aside. Add remaining 1 tablespoon oil to skillet and add ground beef, mustard, and season generously with salt. Cook over medium heat, breaking up beef into bite-sized pieces, until meat is cooked-through, about 4-5 minutes. Use a slotted spoon to remove beef to a medium bowl. Place a slice of American cheese on each tortilla. Melt cheese onto tortilla by either microwaving for about 10 seconds each or heating tortillas in a skillet over medium heat. 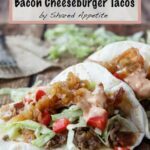 Top each melted cheese covered tortilla with beef, lettuce, tomato, bacon, animal spread, and caramelized onions. Combine mayonnaise, ketchup, sweet pickle relish, and white vinegar in a small mixing bowl. Season with Kosher salt.